After focusing on creating four new video poker games, the game designers at WinADay Casino has been concentrating on beefing up its collection of video poker games lately, but this week they've come out with an amazing new penny slot called Robot Escape. It's a futuristic game with droids, robots and a free spins feature. 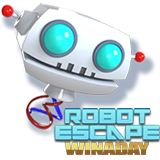 Like most of WinADay's one-of-a-kind games, Robot Escape is compatible with iPhones, iPads and Android smartphones and tablets. Until Sunday WinADay will give you a $12 freebie to try the new game! Low 7X wagering requirement. Previous deposit required. May be used once a day. Valid for all slots and keno. Lower wagering requirement. May be used twice a day. Valid for all slots and keno. Bonuses are valid until January 15, 2017 only. New real money online slot game has free spins that re-trigger up to 20X. Robot Escape is a 5X4 slot. The extra row gives more possible winning combinations. Scatters trigger up to 10 free spins which can be re-triggered up to 20X. Wilds can be sticky which means they remain where they are for the next spin, hopefully creating more winning combinations. Five Droid symbols wins 500X the bet. Players can bet as little as twenty cents or up to $5 per spin. "Players were asking for more video poker games so I’m glad we have such a good selection now," said Michael Hilary, manager at WinADay Casino since it launched 8 years ago. "But players have also been asking for a new penny slot so it’s great that our in-house game design team has given us the new Robot Escape!" WinADay Casino now has 34 premium slots and 19 penny slots. There are 66 unique real money online casino games including video poker, keno and roulette.